There is an abundance of the best mattress encasements available in the market today. You have countless choices with varied prices but with similar features. You may or may not find it difficult to choose just one that’s perfect for your mattress but the list provided below will help you narrow down those choices. You must have spent a lot of money on a Luxury mattress. Some people spend hundreds or even thousands of dollars just for a mattress. Let us not even get to the part on how challenging it is to find the best mattress among the limitless choices you have. Once you’ve found the best mattress for you, then you should care for it. After all, you wouldn’t want to be replacing that every couple of years or so. The best way to do so is by getting the best mattress encasements. If you are buying the best TempurPedic mattresses, you would want to protect it with this encasement. What is the Best Mattress Encasements? Mattress encasements keep bed bugs out. It also protects your mattress from dust mites. Most of the best mattress encasements are waterproof. If you wake up in the morning with tiny red spots on some parts of your body, these may be caused by dust mites or bedbugs. Sometimes, even if you care for your mattress and change your sheets regularly, bedbugs still get into your mattress — no matter what kind of mattress you have — and there’s a huge chance that you will be bothered by these pests. According to a WebMD article, bedbugs are most active at night when you’re sound asleep. Bites from bedbugs are usually painless, however, it can get itchy and irritating after awhile. Bedbugs come from everywhere — from your hair, your clothes that you wore outdoors, luggage. In fact, no matter how clean your home is, these bedbugs are smart enough to get through. The worst part is that female bedbugs can lay hundreds of eggs at a time. Imagine all the trouble those can cause. Most mattress encasements keep the bedbugs out. These encasements are usually zipper secured and have flaps on each end so even the tiniest bedbugs are kept outside of your mattress. If you think that you already have bedbugs inside your mattress, you can have it professionally cleaned first before installing the mattress encasement. However, some mattress encasements are effective enough in keeping the bedbugs in just in case you have no time for professional mattress cleaning. You have to remember though that not having your mattress cleaned professionally and placing a mattress encasement instead is just a temporary solution to your problem. Aside from bedbugs, a mattress encasement can keep your mattress free from dust mites, which can cause a whole lot of other health issues. If your current mattress is giving you allergies, you can look for a hypoallergenic mattress encasement to keep those allergens out. A good night’s sleep is essential to keep you healthy, well rested and productive the next day. Clean and fresh beddings contribute to the comfort you can get from your mattress. This is possible with the help of a mattress encasement. Another great feature of the best mattress encasements is that these are usually waterproof. Fluids like saliva or your wet hair may eventually damage your mattress or make it filthy through time. Larger amounts of liquid such as spilled water or other types of beverages can also cause a lot of damage to your pricey mattress. Leaking diapers also contribute to this type of damage. A waterproof mattress encasement solves this issue instantly as long as it is guaranteed waterproof. You can save money from professional mattress cleaning as you can simply wash the mattress encasement instead. As mentioned earlier, there are literally countless best mattress encasements you’ll find in the market today. If you go to your local store, you might find several from different brands. If you go online, you will see so many choices and if you don’t know exactly what you’re looking for, then you might be hitting a blank wall or you might end up randomly picking just any mattress encasement you see. To make sure you’re getting a mattress encasement that’s worth the amount you spend, here are some basic features to consider when shopping. Most mattress encasements have 360-degree zipper enclosures, which makes installing and removing easy for you. It can be easier if you have someone helping you do this, but much simpler if the mattress encasement design allows you to do it on your own. Size availability is highly important as well. First of all, you must consider the size of your existing mattress. Usual sizes are Twin, Twin XL, Full, Queen, King and California King. Next you must consider the thickness of your mattress. While there are many mattress encasements that are stretchable to fit different thickness levels of mattresses, it is still best to make sure that the one you choose will fit your existing mattress. For instance, a mattress encasement designed for 12-inch mattresses may or may not fit an 18-inch mattress. As always, you should check the durability of the product. More often than not, you can find reviews from existing owners who are happy to share their experience with a particular mattress encasement. Check on the materials used or whether the workmanship is topnotch. For more confidence, it is best when a mattress encasement comes with warranty coverage. There are some of these that offer up to 15 years warranty. The best mattress encasements that is 100% waterproof is a great choice. You must also check on what kind of zipper was used and whether it keeps the mattress secure. This is to ensure that all bedbugs, dust mites and allergens are kept out of your mattress. It is also best if the mattress encasement is made with hypoallergenic materials. Finally, you must weight the pros and cons. No product is perfect so there will always be something there that wouldn’t fully satisfy you as buyer. However, you simply have to be sure that the pros outweigh those cons. A mattress encasement with no warranty coverage but can offer all the basic features you need at an affordable price might be a better choice than one with a 20-year warranty but can’t even keep the bedbugs out. Now that you already know a lot about the best mattress encasements and what you should be looking for when shopping, we will help you narrow down your choices by ranking the best mattress encasements available in the market. The ranking was based on the features of the best mattress encasements, pricing, customer reviews and ratings as well as the pros and cons. 10. Bedical Care Mattress Encasement Unlike noisy vinyl & skimpy microfiber, our soft, quiet cotton terry naturally resists germs & allergens. Without second thoughts, the Hospitology The Original Sleep Defense System Premium Zippered Mattress Encasement easily grabs the top spot on this list of top 10 best mattress encasements. Not only is it very affordable, it is also highly reviewed by thousands of owners who were very happy with their purchase. 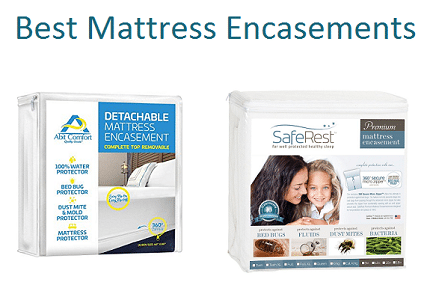 It pretty much sums up everything you need from a mattress encasement — it offers a “Sleep Defense System” that doesn’t only keep your mattress protected but will keep you sleeping soundly through the night as well. If you are buying the best TempurPedic mattresses, you would want to protect it with this encasement. Note: California King is available in 12-Inch Standard only. Of course, you’d want your best mattress encasements to be something that’s reliable, durable and will last for a long time. After all, its purpose is to protect your mattress and protect you. If it gets damaged easily, then it won’t be serving its purpose well at all. 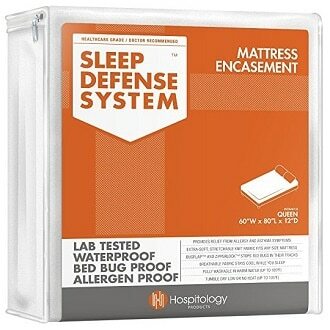 Thankfully, the Hospitology The Original Sleep Defense System Premium Zippered Mattress Encasement is made with very durable 100% polyester knit fabric and zippers. It comes with a 5-year limited manufacturer’s warranty too for your peace of mind. The Hospitology The Original Sleep Defense System Premium Zippered Mattress Encasement offers all the features you can expect and would want from the best mattress encasements. It has a 100% waterproof barrier on all sides. It also underwent independent lab tests that proved it to be 100% bed bug proof. It is extremely soft and breathable to add comfort as you sleep and it also blocks allergens, which is perfect for sensitive sleepers. Easy to clean, can be spot cleaned, machine-washed and tumble dried low. Doesn’t include harmful materials such as vinyl, PVC, phthalates, fire retardant coatings, etc. A number 1 best seller among consumers, the LinenSpa Zippered Encasement has proved to be an effective mattress encasement that can keep your bed free from dust mites, bugs and more. It is even more affordable than the previous Hospitology mattress encasement reviewed if you happen to catch it on sale and is a great option to consider. You can even choose matching pillow protectors along with your LinenSpa Zippered Mattress Encasement. These pillow protectors are available in Standard, Queen and King sizes. The best part about it is that it is thin but durable — it allows you to truly feel the natural comfort of your mattress and it doesn’t have any sound or plastic feel despite being effectively waterproof. Since it is closed through a zipper, the LinenSpa Zippered Encasement is very easy to install. As always, it is best to install it with the help of a partner to make it quicker and much easier for you. It is machine washable too so there’s not much of a hassle when you want to clean it. It is available in Twin, Twin XL, Full, Full XL, Queen, King and California King sizes. However, the LinenSpa Zippered Encasement only fits mattresses up to 12 inches thick. If you have a thicker mattress, you have to consider other selections from the LinenSpa product line or ones from other brands. When it comes to durability, you won’t have to worry much with the LinenSpa Zippered Encasement. This product is made with high quality materials and you will immediately see and feel this as soon as you open the package. It is even machine washable for easy cleaning. Because it can survive machine washing, you know that it must be good. Furthermore, workmanship is topnotch. As mentioned, there’s no crinkling sound of plastic or any feeling of discomfort; thanks to its incredible design and workmanship. Best of all, the LinenSpa Zippered Encasement comes with a 10-year warranty. You’ll be hard pressed to find the best mattress encasements that comes close to that. The LinenSpa Zippered Encasement is fairly thin, which allows you to feel the comfort of your mattress and forget that it is wrapped with an encasement. All six sides of the LinenSpa Zippered Encasement is waterproof and is vinyl-free. It is absolutely safe even if you sleep with kids or with your pets. It is smooth and lightweight but is effective and very reliable in protecting your mattress from dust mites, allergens and bedbugs. The breathable fabric used in the LinenSpa Zippered Encasement makes it cooler and even more comfortable. Another popular choice when is the Restoration Sleep Guardian Premium Mattress Encasement. This is a highly reviewed product that has received amazing comments from hundreds of very happy owners. It is also fairly affordable, whether or not you find it on sale. And if you do happen to chance upon a sale on this item, better grab the chance because that will surely be a bargain. You will surely appreciate as well how the manufacturer has included a 30-day satisfaction guarantee. This enables you to try out the product and if there’s any reason you would find that would make you unsatisfied although we highly doubt it, you can easily return the Restoration Sleep Guardian Premium Mattress Encasement and get a full refund. The Restoration Sleep Guardian Premium Mattress Encasement offers a unique and secure zipper technology, which doesn’t only make installation easy but adds to the reliability of this mattress. 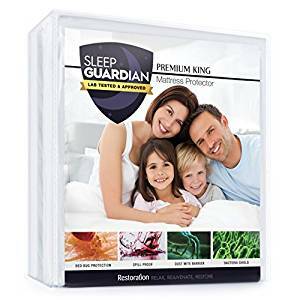 Currently, you can get the Restoration Sleep Guardian Premium Mattress Encasement in Twin, Twin XL, Full, Queen, King and California King sizes. Product descriptions do not exactly say how thick your mattress should be to fit this encasement like a glove; however, product dimensions are available. For instance, the Queen-sized Restoration Sleep Guardian Premium Mattress Encasement is 80 x 60 x 12 inches. There are also some reviews left by owners that indicate that this mattress fits 10, 14 and 18-inch mattresses. If you have anything between those sizes, you should be fine. Thanks to the wonderful designers of the Restoration Sleep Guardian Premium Mattress Encasement, you are guaranteed to be satisfied with the durability of this mattress encasement. It is made with 100% polyester knitted fabric that remains cool and breathable for a comfortable night’s sleep. It is extra soft so it doesn’t take away the comfort of your mattress. Though there isn’t any mention about a product warranty, you can always inquire from the manufacturer directly. Anyway, you can still enjoy that 30-day trial period and you will already see by then the superior quality that this encasement can offer. The Restoration Sleep Guardian Premium Mattress Encasement is waterproof and bed bug proof. You need not worry about allergens and dust mites, fluids damaging your mattress and other bacteria and germs, as the Restoration Sleep Guardian Premium Mattress Encasement is very effective as a mattress protection. As mentioned, the manufacturers exclusively design even its zipper so you can be guaranteed that this encasement remains secure. It is hypoallergenic too, which makes it perfect for sensitive sleepers. The SafeRest Premium Zippered Mattress Encasement is a bit pricier compared to the first three mattress encasements discussed above. However, it is rightfully priced that way because this is a premium product that’s worth every penny you spend. It is a widely sold encasement that has received thousands of very good reviews from happy owners. Yes, it may just be the mattress encasement you are looking for that’s perfect for your needs. Featuring an exclusive micro-zipper technology that can be opened 360 degrees, the SafeRest Premium Zippered Mattress Encasement is very easy to install. In fact, you can even do this by yourself without any help. The SafeRest Premium Zippered Mattress Encasement is available in Twin, Twin XL, Full, Queen, King and California King sizes. Depending on the thickness of your mattress, you can also select from 6 to 9-inch, 9 to 12-inch, 12 to 15-inch and 15 to 18-inch deep mattress encasements. It’s safe to say now that no matter what kind of mattress you have, there will surely be a SafeRest Premium Zippered Mattress Encasement available for you. 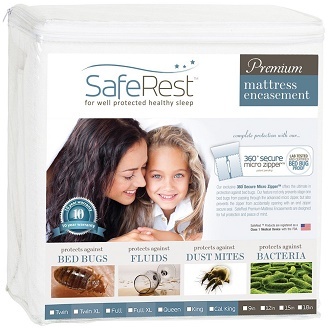 The SafeRest Premium Zippered Mattress Encasement is independently lab tested. This means that its quality and reliability is guaranteed. The materials used on this product are superior and workmanship is at its finest. You can truly feel and see the quality of this product once you open the package. It is made with premium cotton terry surface material, which adds to the overall comfort that the SafeRest Premium Zippered Mattress Encasement can offer. It doesn’t take away the comfort of your mattress though it completely covers it. This product is machine washable. It also comes with a 10-year warranty for your peace of mind. Hypoallergenic and perfect for sensitive sleepers, the SafeRest Premium Zippered Mattress Encasement is noiseless, breathable and feels cool at all times. As mentioned, it was independently lab tested, which certifies its effectiveness in protecting all six sides of your mattress from bedbugs, dust mites, allergens, fluids and everything else that can cause you discomfort or damage to your mattress. Its 360-degree secure zipper with a Velcro flap is an exclusive feature too. The SafeRest Premium Zippered Mattress Encasement is definitely worth a try and you will surely not regret having one in your bedroom. 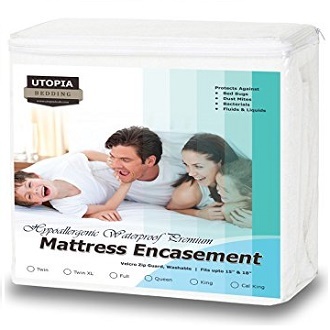 Catch this on sale and you will surely be thankful for the bargain that you can get out of the Utopia Bedding Waterproof Mattress Encasement. It is by far one of the most affordable best mattress encasements you will find in the market but it is far from cheap when it comes to quality and reliability. In fact, there are currently hundreds of high ratings and reviews for this mattress and owners mostly have great things to say. If you are still hesitant about getting a mattress encasement thinking that it’s something you don’t really need, the Utopia Bedding Waterproof Mattress Encasement might change your mind. Not only is it affordable, it is simply reliable and effective in carrying out its purpose. You may also check out the best mattress protectors for some alternative. 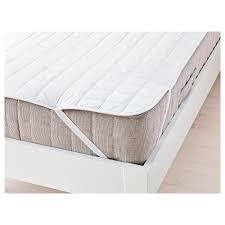 The Utopia Bedding Waterproof Mattress Encasement is surrounded by Velcro Zip Guard along its zippers. It is very simple to install and much simpler if you have someone helping you out. No worries if you have to install on your own as its zippers surround the mattress at 360 degrees. It is stretchable so you can be assured that it will fit your mattress perfectly. However, you must know now that this mattress encasement can fit mattresses of up to 15 inches deep only. It is available in Twin, Twin XL, Full, Queen, King and California King sizes. You will definitely want one for each mattress you have at home. Highest quality materials were used in making the Utopia Bedding Waterproof Mattress Encasement. It is made with stretchable knitted polyester fabric that doesn’t only make installation easy but adds to the overall comfort of your mattress. It is PVC and vinyl-free to assure that it’s safe for use even if you have your baby sleeping on the bed with you. Maintenance is quite easy too as the Utopia Bedding Waterproof Mattress Encasement can be placed in your washing machine for quick cleaning and tumble dried afterwards. Perhaps the only downside is that there’s no warranty information provided upfront but you can simply contact the seller directly for that. The Utopia Bedding Waterproof Mattress Encasement is waterproof and bug proof on all of its six sides. It looks expensive too with the elegant tailoring that’s featured on the product. It is effective in protecting your mattress from bugs, dust mites, allergens, stains and spills. You can expect your mattress to last for a longer period of time, thanks to the Utopia Bedding Waterproof Mattress Encasement. No doubt this product can be trusted as allergists, doctors and entomologists also recommend it. Lucid is a very popular mattress and pillow brand so it won’t even be surprising if your first choice when it comes to mattress encasements is the Lucid Encasement Mattress Protector. Fairly priced and backed with an unbeatable 15-year warranty, you can be guaranteed that you’re getting a great deal with the Lucid Encasement Mattress Protector. Whether or not you are currently using a Lucid mattress, this mattress encasement is still a good option for you. The elasticity of the material used in the Lucid Encasement Mattress Protector makes it very easy to install. It features a deep pocket design, which can fit mattresses that are 6 to 18 inches thick securely. Sizes available are Twin, Twin XL, Full, Full XL, Queen, King and California King. If you wish to prolong the life of your pillows too and guard it from bedbugs, dust mites and damage, you can get pillow protectors in sets of 2 from Lucid, available in Standard, Queen and King sizes. The Lucid Encasement Mattress Protector is made with 100% waterproof fabric that’s quiet and smooth yet durable. Even owners agree and have consistently shared it in their reviews that this seems to be the best mattress protector that you can expect to last for many years. Its top sides and bottom provide effective protection to you mattress. It is made with light, breathable polyester material. Its Zip-Tight enclosure is very secure and gives a smooth elastic fit. Its top is made with Stratosmart Barrier for even better protection. Best of all, the Lucid Encasement Mattress Protector comes with a 15-year warranty, which gives you the peace of mind you deserve. If the manufacturer is confident enough to give you that, then the product must be really, really good. 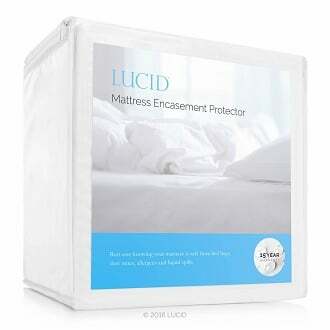 It has been mentioned that the Lucid Encasement Mattress Protector is a 100% waterproof mattress encasement. Spills and stains won’t permanently damage your mattress anymore, which makes cleaning and maintenance a lot easier for you. Its Zip-Tight enclosure does so well in keeping bedbugs, dust mites and allergens away. It fits practically most mattress sizes from 6 to 18 inches. If you have a mattress that’s thicker than 18 inches, you can opt for the Lucid Mattress Protector or the Lucid Rayon from Bamboo Jersey Mattress Protector; however, these do not have zipper enclosures, rather these are fitted sheet style mattress protectors. These fit 6 to 22-inch mattresses. The Utopia Bedding Premium Zippered Waterproof Mattress Encasement is very easy to install even on your own as its mini-zipper feature goes around 360 degrees. It is stretchable too so you only need this for mattresses 15 inches thick and below. It is available in Twin, Twin XL, Full, Queen, King and California King sizes. Because it is very affordable but not cheap at all, you can get one of these for every mattress you have in each bedroom of your home. The Utopia Bedding Premium Zippered Waterproof Mattress Encasement is made with high quality materials and with superior workmanship in mind. The thick fabric is made of knitted polyester. This mattress encasement is not only soft and comfortable to sleep in, it is highly durable too. You can best rely that this mattress encasement will last for many years. It can also be cleaned easily as it is machine washable and can be tumble dried. 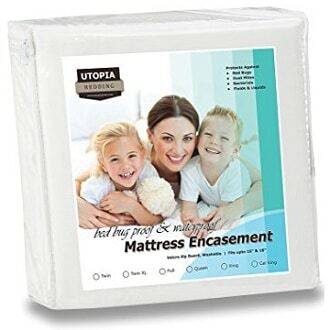 There’s no upfront mention of a warranty coverage, however, this doesn’t stop consumers from choosing the Utopia Bedding Premium Zippered Waterproof Mattress Encasement as it comes from a reliable brand and reviews speak for themselves — this is truly a premium quality mattress encasement. This mattress encasement is absolutely safe even if you’re an allergy sufferer, a sensitive sleeper or even if you sleep with kids or with pets. It is made with high quality material that’s free from vinyl or PVC. There’s TPY backing on all its six sides so that dust mites and other types of bacteria can be kept away from your mattress. Furthermore, it is waterproof to keep your mattress clean at all times. Among all the products we have ranked on this list of the best mattress encasements, the Beckham Hotel Collection Premium Mattress Encasement is the most affordable, whether or not it’s on sale or on regular pricing. It is not cheap at all. In fact, it looks elegant and classy and is indeed a luxurious premium mattress encasement. It serves its purpose well and you can best rely on this product to last for many years. Even better, you also get a 30-day satisfaction guarantee with each purchase of the Beckham Hotel Collection Premium Mattress Encasement. You can get the Beckham Hotel Collection Premium Mattress Encasement in Twin, Twin XL, Full, Queen, King and California King sizes. There isn’t a specific indication of how thick of a mattress would fit with the Beckham Hotel Collection Premium Mattress Encasement. 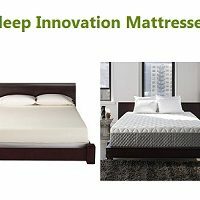 Instead, the manufacturer has described it as one with stretchy material that should work well with all mattress sizes. Specific product dimensions are available if you will be purchasing online. For instance, the Queen-sized Beckham Hotel Collection Premium Mattress Encasement measures 60 x 80 x 12 inches. Despite its very low price, you are still getting a high quality product made with the best quality materials when you choose the Beckham Hotel Collection Premium Mattress Encasement. These best mattress encasements are hotel quality so you can only expect it to last for a long time. There’s no upfront offer of warranty coverage but you can contact the manufacturer directly. However, you can always try it out and see for yourself how well it holds up. Enjoy the 30-day satisfaction guarantee that entitles you to a full refund in the event that these best mattress encasements doesn’t satisfy you. 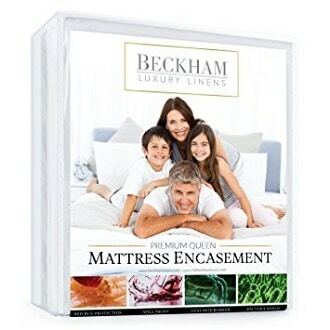 The Beckham Hotel Collection Premium Mattress Encasement is waterproof and bed bug proof. It is made with an extra soft knitted fabric that’s 100% polyester. It remains cool, breathable and comfortable. It is also waterproof so you won’t have to worry about damage on your mattress caused by fluids and spills. Hypoallergenic too, the Beckham Hotel Collection Premium Mattress Encasement is great for allergy sufferers, asthmatics, and those with respiratory conditions. 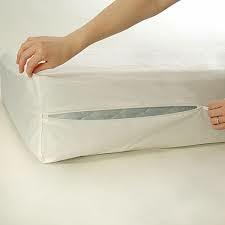 It has a secure zipper closure that keeps the bedbugs and mattresses outside of your mattress. 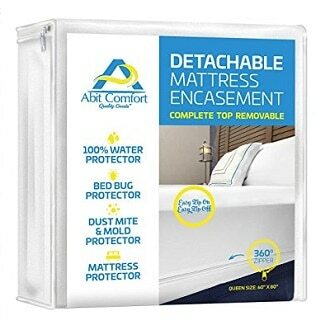 The Abit Comfort Detachable Top Encasement has all the features you expect from the best mattress encasements and more. It is fairly affordable and has a special detachable top feature. This means that you can clean the top part more often, which makes it a whole lot easier for you. Despite its promising features, perhaps one of the reasons why this didn’t make it on top is because of the limited sizes available, which will be discussing in further detail below. The Abit Comfort Detachable Top Encasement is quite easy to install. Without having to lift the entire mattress, you can install the Abit Comfort Detachable Top Encasement as it has a 360-degree zipper design. As mentioned, you can detach the top portion through a zipper feature too. It is currently available in Queen size. We tried looking for other sizes; unfortunately, it seems like only Queen is available for now. Furthermore, one question raised by a potential buyer online, which was replied to by an Abit Comfort seller, is whether a 16-inch pillow top mattress can fit into the Abit Comfort Detachable Top Encasement. The seller mentioned that the recommended size is only for 13-inch thick mattresses and it may or may not stretch to up to 16 inches. They can offer no guarantee. The Abit Comfort Detachable Top Encasement is a fairly new product, hence the limited reviews. Because of this, there’s really no proof yet whether it is the most durable best mattress encasements out there. However, based on the existing reviews left by happy owners, it seems to hold up pretty well. There’s no mention of warranty coverage upfront, but authorized Abit Comfort sellers offer a 100% risk-free satisfaction guarantee. If you’re not happy with your purchase, you can send it back for refund. It is good to mention though that these best mattress encasements are durable enough for machine washing and tumble drying. One of the special features that we have already mentioned above is that the Abit Comfort Detachable Top Encasement has a zippered top that can be removed for easy cleaning. Another feature you will appreciate is that at the end of the zippers, there’s a Velcro patch to keep bedbugs out of your mattress. It is hypoallergenic too. There is no vinyl material used as well, which makes the Abit Comfort Detachable Top Encasement safe even for your kids. The Abit Comfort Detachable Top Encasement is not 100% waterproof. It can protect your mattress from small amounts of fluids, but for larger amounts of spilled liquid, it is best to remove the top part right away before the liquid eventually seeps in to your mattress. So far, the Bedical Care Best Mattress Encasements has received few reviews from customers as it a new product available in the market. However, the features it can offer seem to be promising and the existing reviews are all perfect. Its warranty coverage is quite impressive at 15 year. In addition, it is affordable so it rightfully deserves the final spot on this list. If only it has been in the market long enough for us to actually gauge its durability based on customer experience and the overall satisfaction of owners, then this could have made it to the top of the list. No worries though as the Bedical Care Mattress Encasement is risk-free purchase if you get it from authorized sellers. And as mentioned, it is a promising product so we’re pretty sure you will be satisfied with this mattress encasement too. With this encasement and the best tea for better sleep, you would surely have the best rest of your life. The Bedical Care Mattress Encasement has a 3-sided zipper that lets you put on and take off the mattress encasement easily. It is available in four sizes — Twin, Full, Queen and King. Product descriptions say that it fits mattresses up to 18 inches thick. If you have a thicker or thinner mattress, it is best to contact the manufacturer directly to inquire about this information. It promises great durability that should last for years. There’s no vinyl material used and there’s definitely no cheap microfiber materials used either. The Bedical Care Mattress Encasement is made with ultra-thin polyurethane laminate that makes it 100% waterproof. It has a naturally hypoallergenic, noiseless and breathable soft cotton terry surface for added comfort and durability too. There are no toxins, plastics and phthalates in these best mattress encasements, which makes it safe even if you use it on your children’s mattress. The Bedical Care Mattress Encasement does well in keeping out fluids from your mattress as it is 100% waterproof. It also keeps bedbugs and other insects out. Dust mites, harmful germs and bacteria are also kept out of your mattress. Furthermore, allergens won’t get into your mattress. 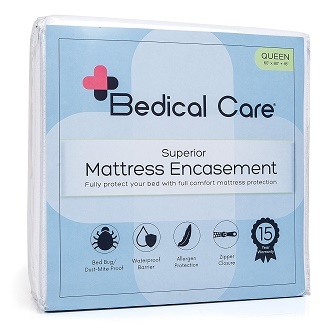 If you suffer from allergies, asthma or if you’re simply a sensitive sleeper, the Bedical Care Mattress Encasement will definitely be a great addition to your mattress. The Full (13-16 in. 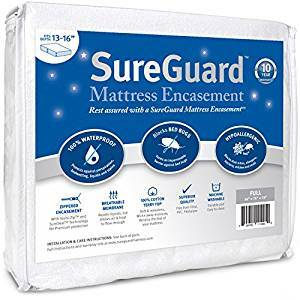 Deep) SureGuard Mattress Encasement from SureGuard Mattress Protectors, – Bed Bug Proof, 100% Waterproof, Premium Zippered Six-Sided Cover, Hypoallergenic, with 10 Year Warranty is ideal when it comes to being waterproof. It provides a 6-sided high-level protection against such materials as urine, night sweat, liquids and any type of stains and thus the mattress is kept entirely fresh and clean all the time. It is also bed bug proof as the superfine zipper along with the Invisi-Zip and SureSeal featured technology, it is able to totally seal the mattress from such irritants as bed bugs. It is highly recommended that this mattress encasement is used along with a Invisi-Zip and SureSeal and also with SureGuard Box Spring Encasement. The Full (13-16 in. Deep) SureGuard Mattress Encasement from SureGuard Mattress Protectors, – Bed Bug Proof, 100% Waterproof, Premium Zippered Six-Sided Cover, Hypoallergenic, with 10 Year Warranty is available in Full size as well as in other sizes such as Twin, Twin XL, Queen, King and California King sizes. Regardless of the size, it can be installed very easily as it is a zippered mattress encasement. It is made from 100% cotton and is extremely soft and noiseless. The 100% cotton terry top is able to wick away spoilers such as moisture and keeps the mattress fresh and clean enhancing the life of the mattress encasement and ensuring durability. It is also completely free of any other types of harmful and toxic chemicals or fire retardants, etc. The mattress encasement enables an allergy-free use as it is capable of totally blocking the common allergens such as pet dander, pollen, dust mites, mold, and mildew. 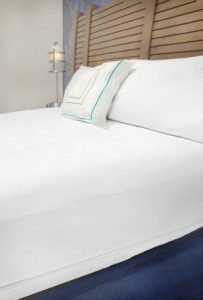 Moreover, the cotton terry top enables a very comfortable and soft sleeping space for the user throughout the night. The feel of the mattress remains the same as the mattress encasement is extremely light and thin. The material contains an advanced membrane which has the capability to not just repel the liquids but lets the air pass through easily and also lets the heat outwards away from the user. Therefore, this mattress encasement is considered as the right choice for memory foam mattresses as it keeps the bed extremely cool and dry for the user. It is also machine washable and washes with cold water. It has high breathability and is thus suitable for memory foam mattresses. It cannot be dry cleaned. 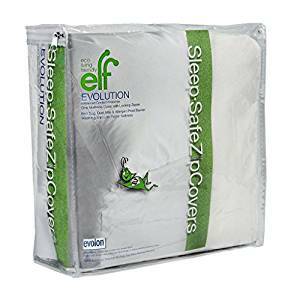 The Evolon Allergy Mattress Protector from Eco Living Friendly, 12″ Queen Zippered Mattress Encasement, Bed Bug, Dust Mite, and Allergen Proof Cover is a product engineered in Germany. It provides to the user a micron level filtration capability with the help of the microfilament technology. This helps to create a strong obstacle against many allergens as they are unable to penetrate the tiny pores. Evolution mattress encasement utilizes an extremely eco-friendly process and as a result of its very large internal surface area, it has the capacity to totally absorb water which could be up to 400% of its weight. At the same time, it has the capacity to dry very rapidly. The Evolon Allergy Mattress Protector from Eco Living Friendly, 12″ Queen Zippered Mattress Encasement, Bed Bug, Dust Mite, and Allergen Proof Cover is only available in Queen size and the other popular sizes are not available in this mattress encasement. It is extremely easy to install as it takes not much effort to wrap around the mattress and close it. As it is brought out of the package, it might feel a bit course, however, as soon as it is washed for the first time, the mattress encasement turns extremely soft to feel and touch. However, the durability factor is not affected. The Evolon Allergy Mattress Protector from Eco Living Friendly, 12″ Queen Zippered Mattress Encasement, Bed Bug, Dust Mite, and Allergen Proof Cover is made out of a very soft fabric which resembles cotton and it has got pores which are extremely tiny i.e. 1-micron size. This extremely tight microfilament Evolution is highly breathable as it is a nonwoven fabric which offers protection to the mattress without even creating a rustling noise. The fabric is tough and keeps the mattress encasement going for a long time. It can be washed multiple times without losing its durability. The fabric used in this mattress encasement has not been coated with anything. Thus, there are no chemicals post-treatments conducted and no OVCs involved in its manufacture. It does not give a feeling of being ‘plastic’ to the user and is made out of a highly breathable fabric which is not just comfortable to touch and feel but also rustle-free. The Sleep Safe ZipCover Evolution mattress encasement utilizes the fabric to provide protection as chemicals cannot offer any protection at all. It offers protection against allergens. It is waterproof.to allow for a comfortable, cool and dry sleep. There are no chemical coatings on this mattress encasement. It is only available in Queen size. The Ultimate Protection and Comfort Waterproof from AllerEase, Antimicrobial, Bed Bug, Zippered Mattress Protector, Vinyl Free, Hypoallergenic, Prevent Collection of Dust Mites and Other Allergens, Queen Sized keeps the user totally dry and cool in the night for a great full night sleeping experience as it allows for air flow as well as passing of heat away from the user. It is extremely soft to touch and feel. It is ideal for those people who have a history of allergies or even chronic asthma. In such cases, the presence of allergens in the mattress could make the condition of the user even worse. 99% of the allergens are blocked from entering the mattress by the blocking mechanism offered by this matters encasement. The Ultimate Protection and Comfort Waterproof from AllerEase, Antimicrobial, Bed Bug, Zippered Mattress Protector, Vinyl Free, Hypoallergenic, Prevent Collection of Dust Mites and Other Allergens, Queen Sized is available in other sizes as well however, it is restricted to Full, Twin and King size only and is not available in Twin XL and California King size. There are many protectors which have 5 sides and thus do not properly protect the mattress. This mattress encasement has a six-sided protective cover which takes total care of the mattress and installs very easily ensuring that the allergens do not enter the mattress. Ultimate Protection and Comfort Waterproof from AllerEase, Antimicrobial, Bed Bug, Zippered Mattress Protector, Vinyl Free, Hypoallergenic, Prevent Collection of Dust Mites and Other Allergens, Queen Sized offer an encasement for the user-mattress which consists of a highly durable but comfortable zippered protector to prevent household allergens getting into the mattress. This results in the extension of life for the mattress as well. The breathable cotton despite being durable is very soft to touch and feel and it is highly breathable as well. Machine washing does not affect durability. The special design of this mattress encasement boasts of a hooded Velcro flap in which the zipper is tucked into. This ends up creating a dual seal mechanism which does not allow the bed bugs to go through at all. Thus, these bugs are unable to burrow in the user’s mattress. The stain and waterproofing features along with antimicrobial protection are built into this mattress encasement. Odors are also blocked as the bacteria are not allowed to grow on the protector. The soft top fabric is extremely plush to touch and it ensures a rustle-free sleep throughout the night. It prevents bed bugs from burrowing in the user-mattress. It does not allow water and other liquids to ruin the mattress. The mattress encasement ensures rustle-free protection throughout the night. It is not available in Twin XL and California King sizes. 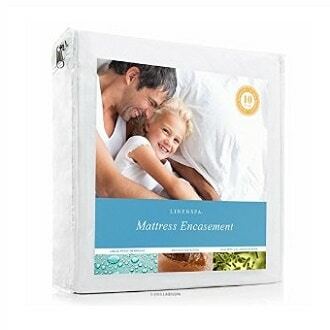 The Waterproof Mattress Encasement with Zipper Closure from WEEKENDER, Hypoallergenic Protector for Blocking Bed Bugs, Twin offers ultimate protection to user mattress as it protects the top, bottom as well as the 4 sides of the user-mattress from all types of stains, fluids, dust mites, and allergens. The mattress encasement also protects the mattress from bed bugs. The protector is made out of extremely lightweight and soft stretch polyester jersey fabric. It is highly breathable and is waterproof and therefore the level of protection is ultimate. The protector does not overheat and the feeling of the mattress is not affected by the use of this mattress encasement. The Waterproof Mattress Encasement with Zipper Closure from WEEKENDER, Hypoallergenic Protector for Blocking Bed Bugs, Twin is available in all 6 sizes which are Twin, Twin XL, Full, Queen, King and California King sizes. The mattress encasement has very deep pockets which very easily accommodate a mattress of depth up to 14 inches. The mattress encasement simply slides over one of the ends of the user-mattress and then the zipper is able to close it off to a perfect fit. The Waterproof Mattress Encasement with Zipper Closure from WEEKENDER, Hypoallergenic Protector for Blocking Bed Bugs, Twin is extremely durable and this fact is exemplified by the 10-year limited warranty offered by the manufacturer on this product against defects due to material and workmanship. The lightweight jersey fabric despite being soft is extremely durable. 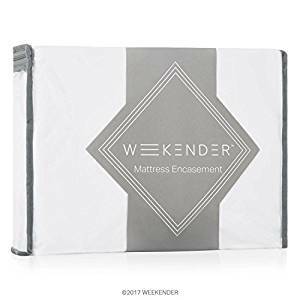 The Waterproof Mattress Encasement with Zipper Closure from WEEKENDER, Hypoallergenic Protector for Blocking Bed Bugs, Twin comes with a 100-day free trial package and the manufacturer offers a 100% money-back guarantee. The fabric used to make this mattress encasement is highly breathable and allows for the user to remain cool and dry throughout the night ensuring a full night’s deep rest without any discomfort due to heat or sweat, etc. It has the capability to get rid of dust mites and other allergens and as such is quite suitable for people who have breathing related issues. The protector can be easily washed in a machine using warm water and can be tumble dried at low heat. The mattress encasement is 360 degrees waterproof and all the sides of the matters, as well as the top and bottom, are protected. The mattress encasement is waterproof on all sides including the top and bottom of the mattress. The mattress encasement protects against dust mites, allergens, and even bed bugs. The mattress encasement is breathable and keeps the user cool throughout the night. Information on how much water it can absorb relevant to its weight is lacking. 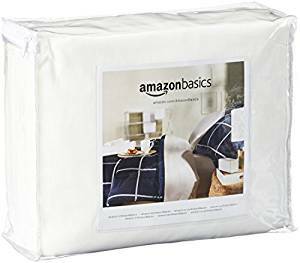 The Fully-Encased Waterproof Mattress Protector from AmazonBasics, Queen, Standard 12 to 18-Inch Depth gives complete protection to the user-mattress. Normally, mattress pads cover the top and the sides of the mattress, however, this mattress encasement provides complete six-sided protection and covers the bottom as well. Thus, the mattress gets fully covered and protected. This allows for a far superior level of protection against the spillage of liquids and helps to make the mattress last longer and keeps its quality and condition intact. The Fully-Encased Waterproof Mattress Protector from AmazonBasics, Queen, Standard 12 to 18-Inch Depth is made out of highly durable and heavyweight polyester knitted fabric which has a specification of 145 gram per meter square (gsm). This is backed by the manufacturer’s one-year limited warranty against defects due to materials and workmanship. The encasement for the user-mattress is therefore extremely durable and in fact, enhances the durability of the user-mattress as well as it provides it protection against liquids, stains, allergens and dust mites. The vinyl-free material of the Fully-Encased Waterproof Mattress Protector from AmazonBasics, Queen, Standard 12 to 18-Inch Depth is very quiet and highly breathable. IT helps to reduce the exposure of the user-mattress to bed bugs as well as dust mites. The mattress encasement is, therefore, hypoallergenic and much heavier than many other lightweight mattress encasements that are found in the market. It is extremely soft despite being strong and is thus able to enhance the air-flow and provide a high level of comfort to the user throughout the night for a deep sleep free of disturbance due to heat and sweat, etc. The hypoallergenic nature of this mattress encasement is ideal for all those people who suffer from allergies or for those who simply want to have a very clean environment to sleep in. The mattress encasement is hypoallergenic. This encasement protects the mattress on all six sides. The mattress is ideal for people suffering from allergies.